Engineered Products Company's Motion Sensing LED Closet Luminaire provides unparalleled performance, improved efficacy, more usable lumens per watt, and is a reliable and sustainable LED lighting solution for small areas. This luminaire features three (3) operating modes. Set the toggle switch on the Motion Sensing LED Closet Luminaire to the operating mode that suits your application. Wall Switch Operation: Will operate as a “switched” luminaire (controlled by a standard wall switch). Occupancy Mode: The “Green” LED (next to the occupancy sensor) indicates the Motion Sensing LED Closet Luminaire is operating in the automatic mode to detect the presence of motion up to 20-feet away. The luminaire will continue to operate until no motion is detected for an additional three (3) minutes, then the luminaire will “Shut-Off”. ETL Listed to UL 1598 Standards. Meets the requirements of the 2017 National Electrical Code: Articles 410.16A(1)(3), C(1)(3), (5), 410.52, and 410.74 (A)(B). For "New" or "Retrofit" applications. Motion activated lighting. No separate line voltage is needed for a wall switch. Energy efficient and optimized light output. Suitable for indoor applications only. Prescriptive rebates may be available from electric utilities or co-ops. Designed for ceiling and wall mount applications. 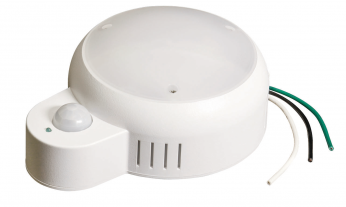 When used with the occupancy sensor, the luminaire automatically lights when occupancy is detected; turns off after three (3) minute vacancy. Cost-effective, eliminates batteries, and will save money. Provides bright lighting in a small form factor. Complies with general rebate requirements for lighting upgrades. Operating Voltage: 120V @ 60Hz, Only! Any Motion Sensing LED Closet Luminaire that has been incorrectly installed by drilling holes, puncturing, piercing or any other means that will alter the product’s integrity. Damage caused by the use of parts, components, and/or other equipment(s) that is not compatible, suitable, or unauthorized by EPCO for use with the Motion Sensing LED Closet Luminaire. Damage resulting from use of the Motion Sensing LED Closet Luminaire in what EPCO, at its sole discretion, considers extreme applications. Product damage as determined by EPCO to be caused by a crash, impact, or obvious signs of abuse to the Motion Sensing LED Closet Luminaire. There are absolutely no charge-backs for any labor required to remove, re-install, or re-power the Motion Sensing LED Closet Luminaire.